DANM’s own Nick Andrade (DANM '16) has designed the media for a new play, Maria: A Telenovela for the Stage, a DANM / Theater Arts co-production. 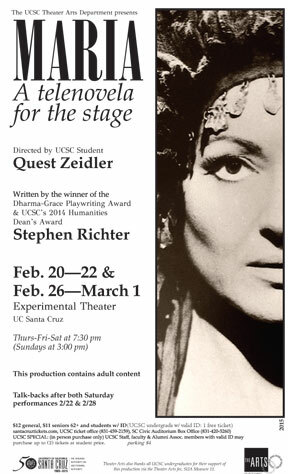 Written by Stephen Richter, currently a graduate student in UCSC's Masters in Playwriting program, the play is an adaptation of the Greek classic Medea that mixes latino/a pop culture, the politics of Hollywood, and desire. It was awarded the 2014 Humanities Dean's Award and the Dharma Grace Playwriting award by Chuck Lorre's Dharma Grace Foundation. Maria: A Telenovela for the Stage opened Friday, February 20 at the UCSC Experimental Theater and continues through Sunday, March 1, 2015. For a complete schedule of showtimes and more information about the performance, visit this link.